The Chunky Dory Ask for video of boat running. 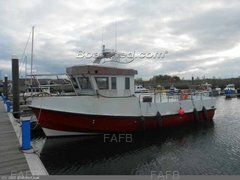 May part exchange boat and cash for trawler style yacht or conversion. Sadly selling my One off Wilson Flyer. I have never seen one so good. The boat is in Dunoon and can be seen and tested both in and out of the water. It has a four wheel trailer with new bearings and brakes. New tyres are about to be fitted. It is towed with a Toyota 3 litre deisel surf good jeep long MOT. This could be available to purchase or the boat could possibly be delivered. Rare chance to own the legendary wilson flyer ready to go off the key. Any inspection welcome. You wont find another like it. From what I was told on purchase this boat was built by wilson for harbour duty in Guernsey. Once they were finished with it it went through a couple of owners who basically neglected her by leaving her parked on the trailer for several years. It has under 600 hours from new. I have renovated it. 23 foot wilson Flyer Refurbished this year to a high standard. Starting at the bottom. This has a metal shoe fitted to the keel to protect it. Antifouled in black with blue bootline. The hull was polished above this. New U section rubbing strake fitted. Deck and Superstructure re gel coated with top coat, not paint. Wheelhouse sides and windows added. Aft deck roof fitted Marine ply paneling and new engine box rear deck built. Engine Transmission.. Original from new. Mercruiser 1.7DTI inboard deisel. Alpha one Generation 2 outdrive. Outdrive has been stripped cleaned new water pump assembly fitted. New anodes fitted. New solonoid for outdrive trim/tilt. Fully serviced using only quicksilver parts and oils etc. Two propellors with it. 1.7 dti mercruiser (isuzu) In stunning condition. New belts and tensioners. New alternator and starter motor. Genuine parts only used. All oils and filters changed. Heat exchanger cleaned and serviced. All hydraulic fluids changed. Aux Engine is a small 6 hp evinrude with almost no use at all. New impellor fitted as a matter of course and serviced. Comes with 20litre fuel can. Electrics are mostly original except for the added Navigation and accessories. All electrics work as designed to. New bilge pumps for deck and bilge have been fitted. It has radar and sounder fishfinder (new) It has a new unregistered dsc radio. It has powerful cree flood lights fitted externally with cabin lights internally. New solar panel charge system fitted and two new batteries fitted. Battery isolater switch fitted also. Rubber floors and rear deck. New curtains wood panels throughout. Foam for all cushions but not covered yet. I will do it free if I have time but not included otherwise. New canopy. Spare material and fittings. Main anchor with chain and rope. Boat hook. Spare anchor with chain and rope 4 fenders 4 lifejackets all ropes required for use full tank of deisel. Spare pilots seat to match the one fitted so two seats could be fitted if required. A few spares included. Also two rods and reels. Trailer will have new tyres fitted and already has new brakes and bearings fitted. Boat travels at 12 knots without the turbo kicking in. This makes for very economical cruising. 6 hours of a mix of fast then cruising then trawling returned 4 gallons. Under 1 gal per hour average fuel consumption. I dont really run her flat out or fast that often, so cant comment on fast fuel consumption. Boat is towed with my trusty not rusty Toyota 3ltr deisel surf. Long MOT very good condition 1996. This could be included at the right price. Alternatively I could possibly deliver it for cost if not overly far away. The jeep is not for sale seperately. Thanks for taking the time to read my lengthy advert hope it helps and if I have missed anything please let me know. This is a genuine boat and a genuine buyer will not be dissapointed in her. No offers without veiwing. Message with number for call back.